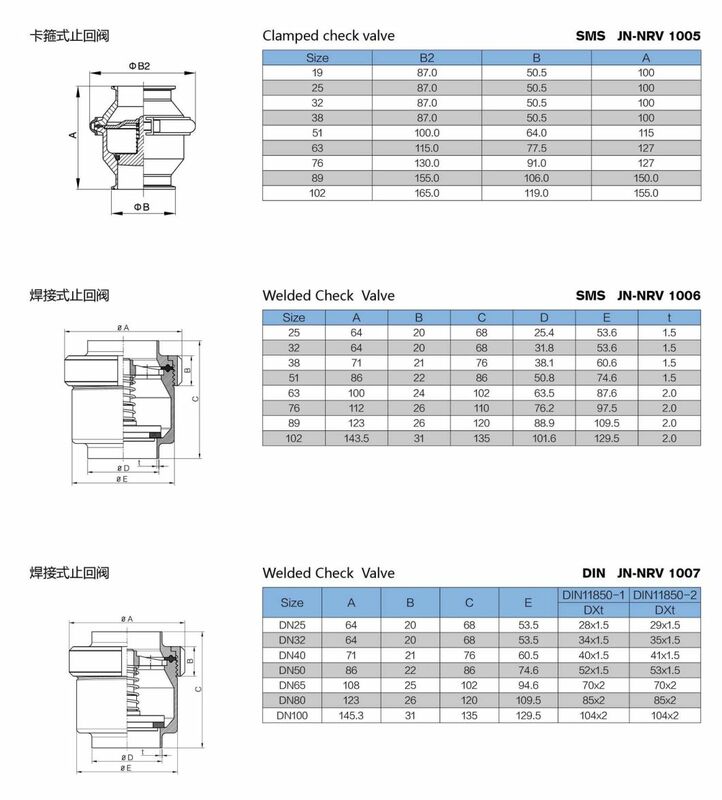 Sanitary check valves are widelyÂ used to prevent the liquid flowing from revering direction.The check valves can ensure the fluid flow in one way direction and inhibit the fluid flow back. The check valve ( non return valve) is normally working automatically, it is closed if no media flow.When the pressure of the fluid is heavier than the pressure of the spring, the check valve open automatically. 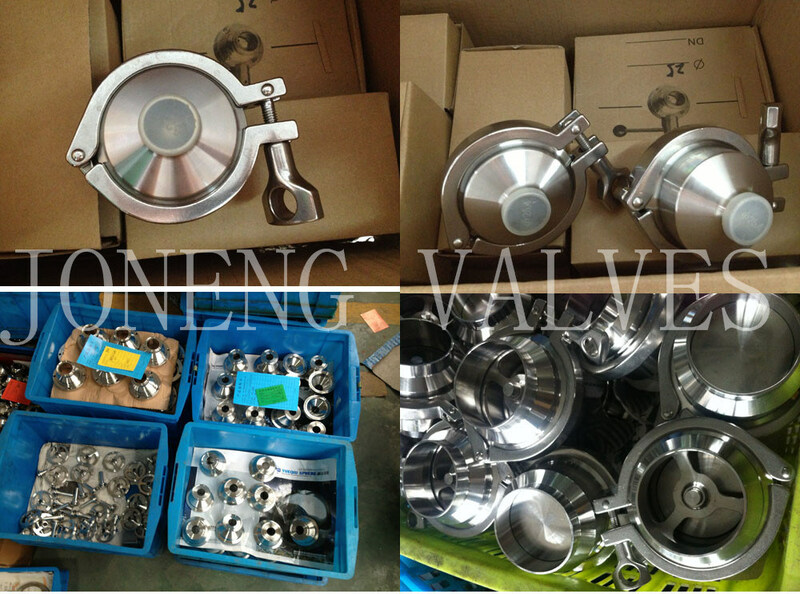 The check valves are also called sanitary spring check valve, sanitary disk check valve, non return valve, NRV. ValveÂ discÂ isÂ madeÂ fromÂ casting. The check valves can not be used for sticky ,adhesive, viscous products. 1.Â Â Â AreÂ youÂ aÂ tradingÂ companyÂ orÂ factory?Â Â Â Â WeÂ areÂ aÂ manufacturingÂ factory. 2.Â Â Â DoÂ youÂ haveÂ FDAÂ certificateÂ forÂ theÂ materials?Â Â Â Yes,Â FDAÂ isÂ veryÂ importantÂ forÂ theÂ foodÂ processingÂ machines. Â Â Â Â Â QualityÂ controlÂ isÂ veryÂ importantÂ toÂ avoidÂ materialÂ mixingÂ andÂ poorÂ quality.Â WeÂ controlÂ theÂ qualityÂ fromÂ beginningÂ toÂ theÂ end.Â WeÂ onlyÂ haveÂ 304Â andÂ 316LÂ twoÂ differentÂ materials.Â 100%Â inspectionÂ onÂ rawÂ materials.Â DuringÂ production,Â differentÂ materialsÂ inÂ differentÂ places.Â AfterÂ materialsÂ areÂ finished,Â weÂ chooseÂ 10%Â forÂ inspection.Â IfÂ thereÂ isÂ 0.1%Â problemÂ inÂ 10%,Â thenÂ noÂ excuseÂ toÂ goÂ aheadÂ forÂ inspectingÂ 100%Â ofÂ theÂ materials. 6.Â Â Â HowÂ longÂ isÂ yourÂ deliveryÂ time?Â Â Â ForÂ normalÂ productsÂ inÂ 7-10Â days;Â forÂ bulkÂ order,Â inÂ 15-25Â days.Â ItÂ depends.